With a conservatory you’ll be able to add space and value to your home for minimal cost. In fact this is becoming the preferred option for many homeowners, rather than relocating and the thousands of pounds associated with a move. There are a range of designs to choose from with conservatories, including Victorian, Georgian, lean-to and bespoke. This allows every home the opportunity to have a style in keeping with the existing infrastructure and benefit from extra space. Conservatories are typically used as dining rooms or living areas, offering a fantastic place to relax in both summer and winter. With excellent energy efficient qualities you’ll also have the chance to keep your bills low. It’s not uncommon to find properties with a conservatory installed and it has become very popular in this day and age. Keep your bills low with great energy efficiency. The latest insulation techniques can be used to make sure you don’t pay out too much on your annual heating bills. 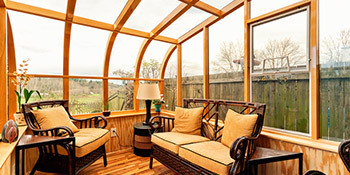 Why choose wood for your conservatory? There is one main reason you would pick wood over other options such as uPVC and aluminium, and that’s the aesthetic appeal it has to offer. There’s no denying wooden conservatories can look amazing. As a feature for your home it’s unrivalled and is fantastic for traditional homes. As a bonus, even listed buildings or properties in Conservation Areas could be granted planning permission for a wooden conservatory. If you’re interested in a wooden conservatory, then you’ve come to the right place. By completing our quick form we’ll provide you with up to four FREE conservatory quotes from local, vetted and reputable companies. Homes are given an energy score depending on just how efficient they are and ratings are shown in the data beneath. This ranges from A, by far the most energy efficient, to G, the least efficient. With a higher rating you're more likely to have less costly energy bills as more heat will probably be kept in the house. You'll be able to enhance your home's efficiency with insulation including upvc double glazing, loft lagging or wall cavity insulation. There are many types of property in the UK and the info underneath highlights the type of homes within Uk. Throughout the country the most popular housing types tend to be semi-detached and terraced housing, but detached homes, flats and bungalows are also available. The data listed below gives an indication for the number of homes in Uk that are central heated and non-central heated. Properties are heated by a number of sources which indicate how costly annual energy bills will be. Types of central heating include gas, electricity, oil, solid fuel and LPG boilers. Changing the way your home is heated can easily see you with cheaper bills. The data underneath reveals the spread of properties heated by different fuels. Around the UK the most common hands down are gas heated properties, followed by electricity and then oil. Biomass central heating boilers are also growing in popularity, heated by renewable products such as wood pellets or agricultural waste.|Houses in the UK are warmed by a number of fuels, which include gas, electricity, oil, solid fuel and LPG boilers. Each fuel has a varying cost associated with it and that means you may find yourself with less costly energy bills by altering how your household is heated. Even solar thermal panels are being considered by many as a way to lower heating bills for the many years to come.